An unarmed black man was shot and killed by a Broward County deputy in Lauderdale Lakes during a disturbance call at an apartment complex. According to the Broward Sheriff's Office, Jean Pedro Pierre was attacking one their deputies. When backup arrived, Pierre charged toward the other officer. "Our backup deputy saw something which caused him to fire his firearm,” said Broward Sheriff Scott Israel. BSO was responding to a call at Sunset Hills Condominium, 3610 NW 21st St., on Wednesday afternoon. A video posted on Facebook captured the moments leading up to and after the shooting. The video shows Broward deputy Sean Youngward laying on his back while Pierre holds his leg. The person recording tells Pierre, "Turn him loose. Don't get yourself in trouble." The video appears to be taken from above inside the apartment building. Youngward swats at Pierre with a baton, but Pierre continues to hold onto his leg. Several voices in the background implore Pierre to let the deputy go. Sirens can be heard in the background. One man tells Pierre, "They're gonna shoot you man. They're gonna shoot you, bruh," and a moment later another officer enters the frame. At that point, Pierre starts to kick the officer on the ground and drags him by the leg. The backup officer draws his gun as one bystander screams to the officer, " Tase him, tase him, don't shoot him. He doesn't have a gun." A bystander yells to Pierre again to let the deputy go, "You're gonna get yourself in bad trouble, man." At about a minute into the video Pierre lets Youngward go and starts toward the backup officer who is holding a gun. The officer and Pierre are no longer visible in the video and three shots ring out within seconds. The actual shooting was not captured on the video. "They shot him," says one of the men in the background. When the camera refocuses, it shows Pierre wounded on his back. He was taken to Broward Health Medical Center where he died. According to BSO, Deputy Steven Briggs was the backup officer. Briggs ordered Pierre to stop. “Instead, Pierre charged at [Deputy] Briggs and several shots were fired. 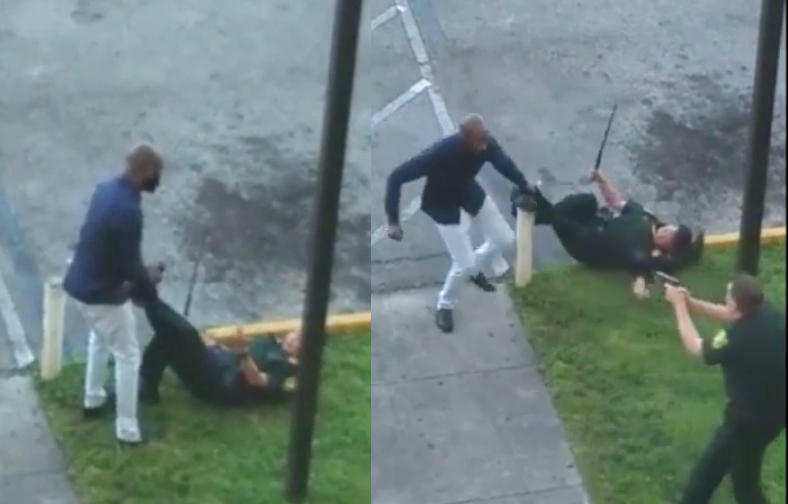 Pierre was not armed," BSO said in a news release. Both officers were wearing body cameras. They have been placed on administrative leave, per the department's policy. Florida Department of Law Enforcement will investigate the shooting.